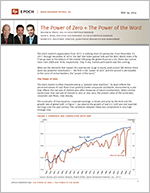 The Power of Zero + The Power of the Word - Epoch Investment Partners, Inc. The stock market’s appreciation from 2011 is nothing short of spectacular. From December 31, 2011 through December of 2013, the S&P 500 Index gained 54% and the MSCI World Index 47%. If we go back to the bottom of the market following the global financial crisis, these two indices have risen 200% and 165%, respectively. Few, if any, market participants saw this coming. The stock market is often characterized as a “present value machine.” Its level reflects the perceived stream of cash flows from publicly traded companies worldwide, discounted by a rate that reflects the real rate of interest plus other measures of future uncertainties. When central banks lower that real rate of interest to zero or near zero, the present value of the numerator, corporate cash flows, rises sharply. The numerator of that equation, corporate earnings, is driven primarily by the level and the growth rate of global GDP. In Figure 1, we observe the growth of real U.S. GDP and real reported earnings over the past century. The correlation between these two components is very high through time. Real GDP is driven by only two variables — growth in the work force and growth in productivity. These two variables over the past several decades have averaged 1.0% and 2.0%, respectively. Add inflation to that number and you have nominal GDP. Thus, a realistic expectation for nominal GDP growth is 4-6% over the long term, and a forecast for earnings growth of a similar rate is a reasonable one. When the discount is lowered for that long-term stream of expected earnings or cash flows, it has a powerful effect on the present value of that stream. In Figure 2, we show both short- and long-term interest rates before and after the global financial crisis. In our view, the introduction of quantitative easing (QE) has been the single most important factor contributing to the rise in equity prices over this period. Although he was speaking for the ECB, his comments eventually came to represent the mantra for all central bankers at the time. He said in effect that central bankers will not allow the monetary system built over the past many decades to fail. Central bank policies will effectively ensure that the left hand tail of the typical return/risk curve will not happen. In Figure 3, we show the combined effects on stock market levels of the “power of zero” and the “power of the word.” Whereas P/E ratios declined in 2011, they soared in 2012 and 2013. Nearly two-thirds of the stock market gains in the U.S. and three-quarters of the gains globally were attributable to P/E multiple expansion, with the balance coming from dividends and earnings. Even the earnings line needs some qualification, as much of those gains were impacted by share buy backs (more than half in 2013 alone for the S&P 500!). Speculation in financial assets was encouraged by these two elements. Government bonds performed well but high-yield bonds performed even better as yields fell and credit spreads tightened. Blue chip stocks rose, but speculative stocks rose even more. The “earnings line”was replaced with the “dream line” particularly evident in the prices of many bio tech and social media companies. Consider one example of the dream line: Tesla Motors. One has to be impressed with the intellect and success of the company’s visionary leader. But with a market capitalization of $26 billion for an auto maker that can barely produce 35,000 cars per year, what about Tesla’s valuation? The market for $80,000 electric cars with no dealership network to service them is unknown and is largely dependent on government subsidies for buyers and tax credits for the company. Nevertheless, some analysts on the sell-side have justified Tesla’s valuation. We recently observed a televised analyst say “when Tesla is earning $25 a share . . .” That estimate, presumably at some point in the future, is used as an anchor for a target price as the stock shifts into a “concept holding.” The analyst accomplishes this transition by changing what the company does (making cars) into something entirely different: making high-tech consumer products. The argument goes something like this: “one cannot value Tesla as an ordinary auto maker where the $25-per-share earnings might be valued at a multiple of 10 times earnings. It is really a high-tech consumer products company, which deserves a multiple of 20 to 30 times earnings, so the target share price could be in the $500-$750 range.” The question of how many technology companies sell for 20 to 30 times earnings is another matter. Many large tech firms sell at multiples closer to auto stocks. We do not mean to single out Tesla, as there are dozens of stocks that have recently been wrapped in “concepts” that provide flexibility in estimating valuation multiples. (That is, if there are earnings to provide multiples! The majority of companies in the IPO market over the past twelve months had no earnings.) What is driving these concept stories and their valuations? The answer appeared to us in a sign outside a bar recently. “Alcohol served here: because no good story ever started with a salad!” The “alcohol” fueling today’s market is QE. By artificially impacting the discount rate for future (or imaginary?) earning streams, we are witnessing the power of zero. Concept stocks are effectively options, whether they appear in bio tech, fuel cells, social media, or Tesla. They are enormously and positively affected by the power of zero because the “dream line” is essentially a long-duration “wish line” that is affected more by the power of zero than any other type of investment. QE has made life more difficult for traditional equity asset managers. We need real businesses with real cash flows along with managements who are good capital allocators. Those firms will avoid history’s dustbin of failed businesses, but their stock prices may well lag in markets fueled by QE, where “dreamin’” pays. At Epoch we seek to identify companies that generate free cash flow each and every year and possess managements with a record of wise capital allocation decisions between capital returned to shareholders in the form of dividends (cash, buybacks or debt pay downs) and capital reinvested for growth via cap ex or acquisitions. While this methodology has proven to be highly successful over many decades, it can falter when market returns are dominated by P/E expansion rather than earnings and dividends. In Figure 4, we show over eighty years of rolling ten-year returns for the S&P 500. From point to point, P/Es added little to long-term returns, as shown in Table 1. But within that long time frame, certain periods were dominated by P/E multiple expansion. And unless one can forecast the drivers of P/E multiples, namely inflation and interest rates, the fundamental investor’s performance may lag during these periods. Today we find ourselves in a world with sluggish real growth and interest rates at all-time lows, reflecting extremely low inflation and a huge surplus of excess savings. Inflation may remain very low in these circumstances, causing P/E ratios to remain relatively high on a historical basis. Might P/Es rise even further from here? Not likely in our view. QE is being withdrawn in the U.S. and reduced in the U.K. However, it remains the most likely monetary policy choice for the euro zone, even if the mechanisms for its implementation are not at all clear. Japan, too, appears to have little choice except to expand its current version of QE, as inflation remains well below government targets. All in all, P/Es are more likely to contract than expand, reflecting either continued sluggish growth as a result of the huge global overhang of debt (Figure 5) or the outcome of the end of QE in the U.S. and the U.K. The gradual end of QE will signal that the artificial depressant imposed on the real interest rate, and therefore supporting stock market levels, is ending. Hence, the discount rate for financial assets will begin to rise. The “dream line” will become more of a nightmare for speculators as this rise in the real rate of interest occurs, but the “earnings line,” free cash flow to us, will become ever more important. Put another way, we believe the multiple expansion phase of this market is over and free cash flow analysis will again be required for superior equity returns.